Can you please tell me anything about this doll I have. She has qmc 1986 on the back of her head. 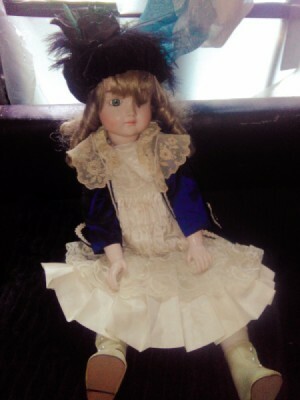 A doll made in 1986 is not considered an antique. I don't think it has much value. i do not believe you will be successful in finding information with only this information. you may research porcelain dolls on eBay or Etsy and be able to find your doll but this would be a very time consuming search. Considering this is all of the markings on a 1986 doll, I would have to assume it is not very valuable but then my assumption could be wrong. eBay has a discussion board where doll sellers frequently answer questions about dolls (and other items) but you would have to ask for help in identifying your doll; then upload the photos and give measurements and any other information you have.